Sweeping education reforms introduced in New Orleans following Hurricane Katrina have dramatically lifted students’ chances of finishing high school and entering college, according to a new policy brief released this week by the Education Research Alliance for New Orleans. Even more striking, the new policies appear to have narrowed large gaps in educational attainment between advantaged and disadvantaged students. The report was authored by Doug Harris, ERA’s director, and Matthew Larsen, an economics professor at Lafayette College. The alliance was formed by Tulane University to study the changes instituted after the hurricane, which wiped away most of New Orleans’s existing education governance structure. Prior studies have indicated that those changes — turning over nearly all of the city’s schools to charter operators and allowing families near-total freedom to choose where to enroll their children — brought major improvements in K-12 academic achievement. The latest publication goes even further. 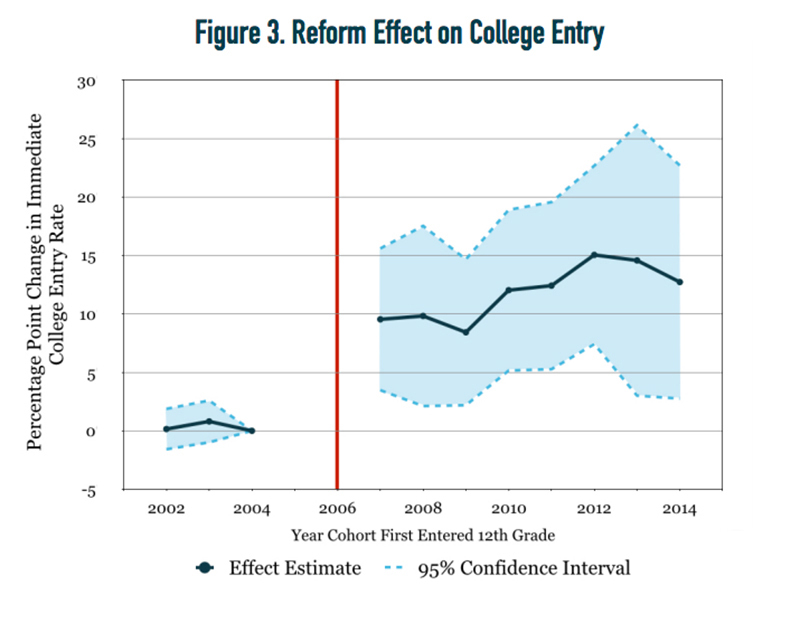 While rising test scores offered strong evidence in the reforms’ favor, later-life outcomes are seen as better indicators of their effectiveness. The researchers find that the changes boosted the rate of immediate college entry for New Orleans students by 15 percentage points. College persistence (the rate at which students remain in college for two or more years) grew by seven points, while college graduation shot up five points. In an interview with The 74, Harris said that the post-secondary results were the most noteworthy in the report. One shortcoming of previous New Orleans analyses has been that not enough time had passed to truly know if more students were passing through high school and on to college — and, if they were, how many were then earning a degree. Now that nearly 13 years have passed since Katrina made landfall, kids who were enrolled in pre-K before the storm are preparing to apply to college. It can also be difficult to point to a starting line for the reforms. Though many of them, including the statewide takeover of the school district, took place immediately post-Katrina, it still took years for students to return to the city after having been evacuated — and for charter operators to open new schools and welcome them back. According to Harris, two items of the study stand out. One is the sheer range of outcomes across which he and Larsen detected progress. In cases where standardized test scores suddenly shoot up, improvement may come at the expense of the high school graduation rate, since more rigorous standards and pedagogy drive the weakest students to drop out. 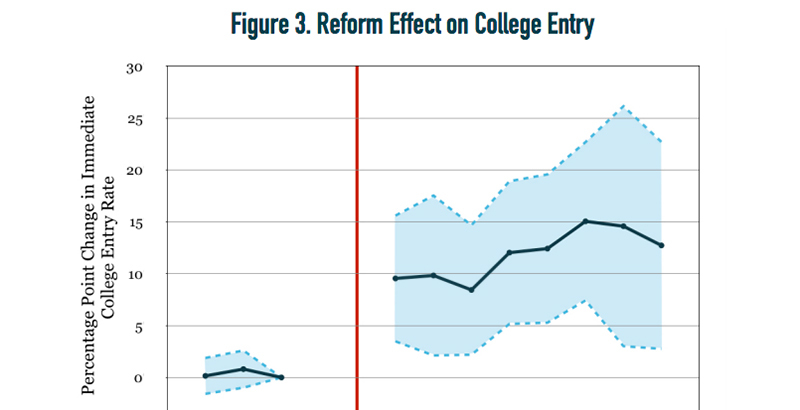 Meanwhile, when high school graduation rates tick upward — as is the national trend — college entry can head in the other direction, since the marginal students who would have otherwise dropped out often don’t go to college. But in New Orleans, a plethora of indicators have shown promising movement. Pupils are scoring higher on standardized tests. They are picking up diplomas at higher rates and entering college immediately. Those who enroll in college stay longer, and an encouraging number are finishing with a degree. Perhaps even more promising, black and low-income students have seen greater improvements than white and more affluent students in both high school graduation and college entry. That means that the achievement gaps separating the city’s most advantaged students from its most disadvantaged ones have meaningfully shrunk. One potentially complicating factor: For the first time in over a decade, those positive effects are now in the hands of the city’s elected school board. While the era of foundational school reform in New Orleans has proved to be broadly popular with residents, some worry that inevitable disputes over authority and jurisdiction could endanger academic gains that have taken years to develop.